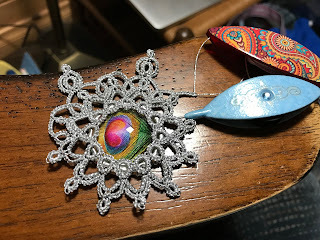 I'm still busy working on my last Christmas afghan, but I've also been carrying tatting with me and working on it when I can. 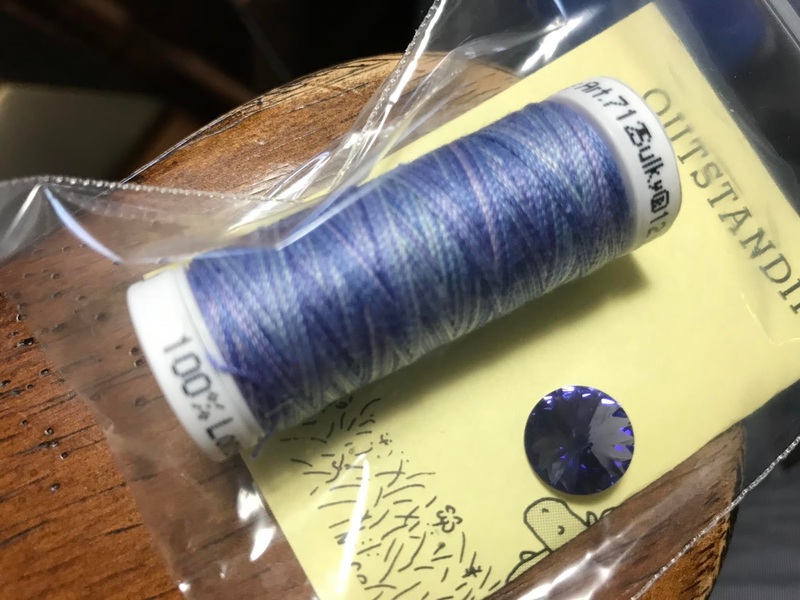 The blue Ice Drop is a Swarovski rivoli and 12 wt Sulky cotton #712-1293. I love the shade of blue! The red Ice Drop is a compass charm and DMC size 80. 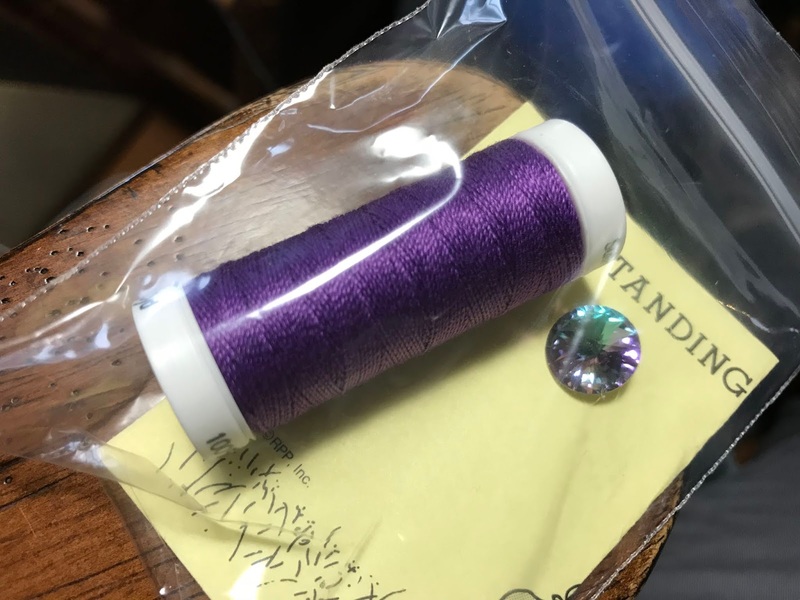 The thread covers up the compass points, but highlights the compass lines. I think it looks pretty cool! Several of us retired teachers got together at our friend Peggy's this afternoon. We all taught together for many years. I'm not sure of the retirement order, but I think Judy (3rd grade) was first, followed by Peggy (5th grade), Marilynn (2nd grade), Pam (4th grade), Robyn (1st grade), me (elementary library and computer), and then Edna (kindergarten). Gosh! That covers all the grades! There were others we taught with who were unable to attend. We would have loved to have them with us; still, we had a great time together! My goal has been met! 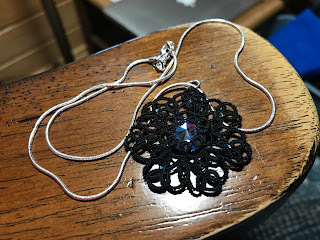 I just finished Alexa's necklace, and I will be able to give them to the girls tomorrow. 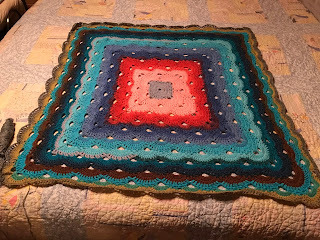 Now, it's back to the afghan! Karina's necklace is finished! This one is in 12 wt Sulky Blendables and a 12 mm Swarovski rivoli. 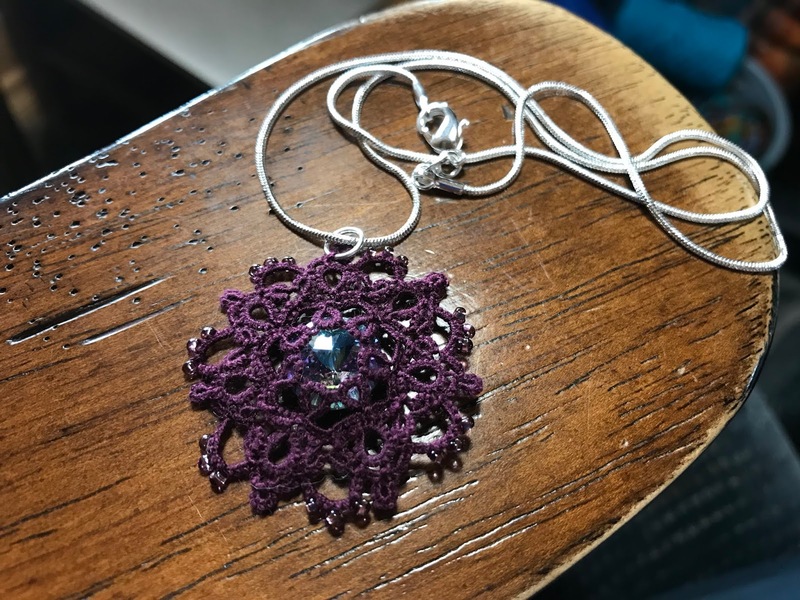 I really am enjoying tatting these beautiful necklaces! 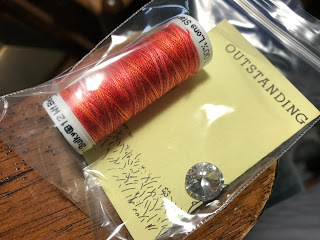 Kylie's necklace was a bit of an adventure. Kylie asked for no extra beads, which meant this would be one of the simples necklaces for the girls. Ha! 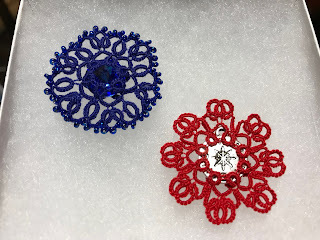 I was almost finished with it, when I made a mistake on a ring. Although I was trying to be very careful, I shredded the thread and had to cut it off and start over. Yesterday morning I was on the phone with Mom and daughter Joanne, one right after the other. I hadn't wound enough thread on the shuttle, so I needed to add some more. Not a problem, right? I added the thread to the shuttle, and then got up to get a cup of coffee. After a few sips, I realized the pendant was missing. I searched on and off all morning long. I never did find the piece I was working on, so in the afternoon I started a third time. Luckily, the last try went smoothly! I wonder if I'll ever find that original piece? 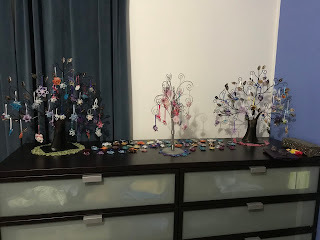 I know I've been a slacker when it comes to blogging, but it's simply because I've been too busy! 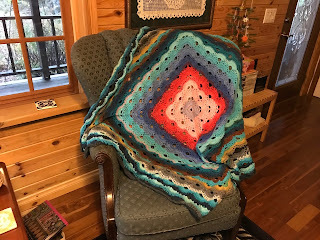 I reached my goal of finishing Eva's afghan by Thanksgiving! I finished it up Wednesday night... one more afghan to go! There was no school on Wednesday, so I had plenty of time to go grocery shopping and finish getting the house ready for family. Daughter Andrea and family arrived late Wednesday night. Carol and Jon were here late Thursday morning. Alison and family came early afternoon, and Karen and Larry arrived soon after. Of course, we had way too much food! Granddaughter Ella took before and after pictures of the feast, but I forgot to have her share them with me before the family headed home. After cleaning up, we pulled out our favorite family game, Mexican Train. Grandson Aidan took over for me, so that I could go to bed at 9. Yes, I was the party pooper... I have a really difficult time staying up past 9! The kids stayed up until 11 to finish the game, and I learned in the morning that Aidan and I had won! The feasting continued on Friday. Everyone who could (Aidan is allergic to eggs), enjoyed scrambled eggs, fried potatoes, bacon, and fruit salad. For lunch... leftovers! Andrea and family left for their next destination in the early afternoon. Alison and family were able to stay until early evening. Dave and I had some more leftovers for dinner, and then we started decorating for Christmas. The holiday season has officially begun! 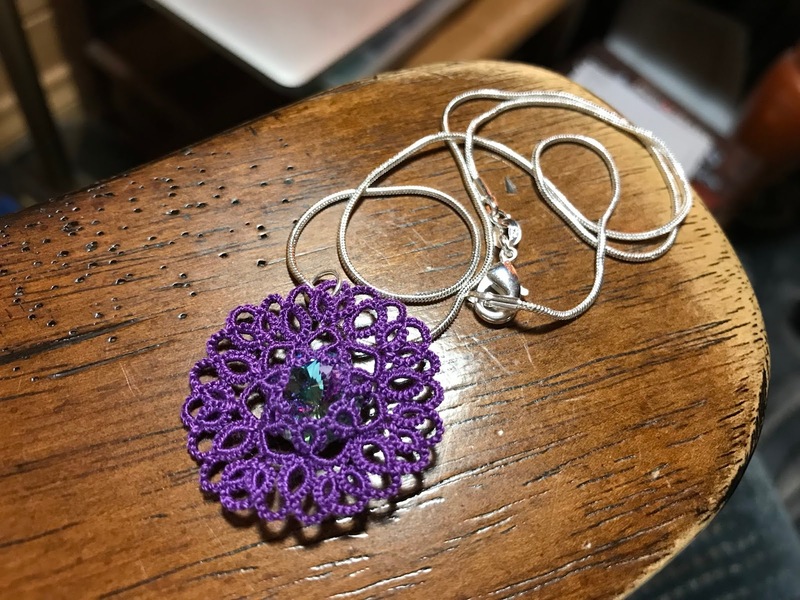 I finished Sydne's necklace this morning! 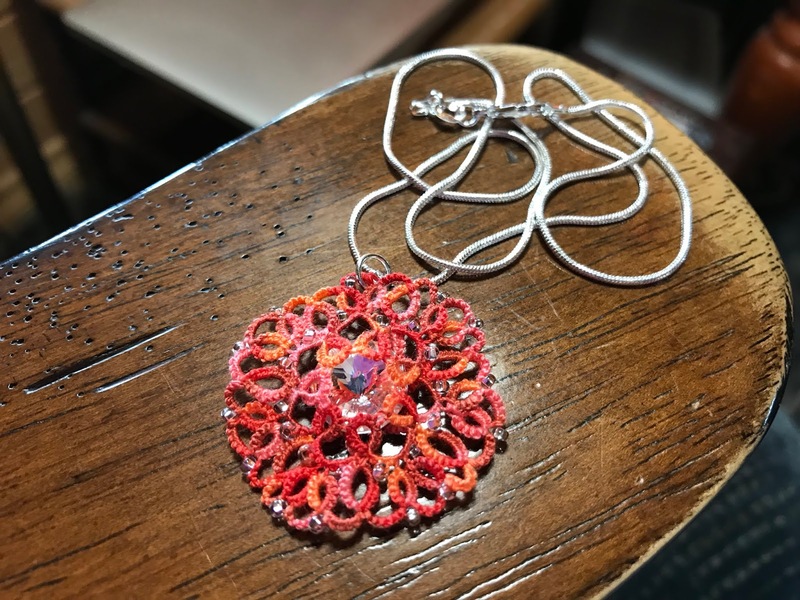 I tried to use my necklace from Mandy Kerwell-Bez as a pattern, but mine turned out a bit different. I guess that's a good thing, right? Today was a wonderful mail day! 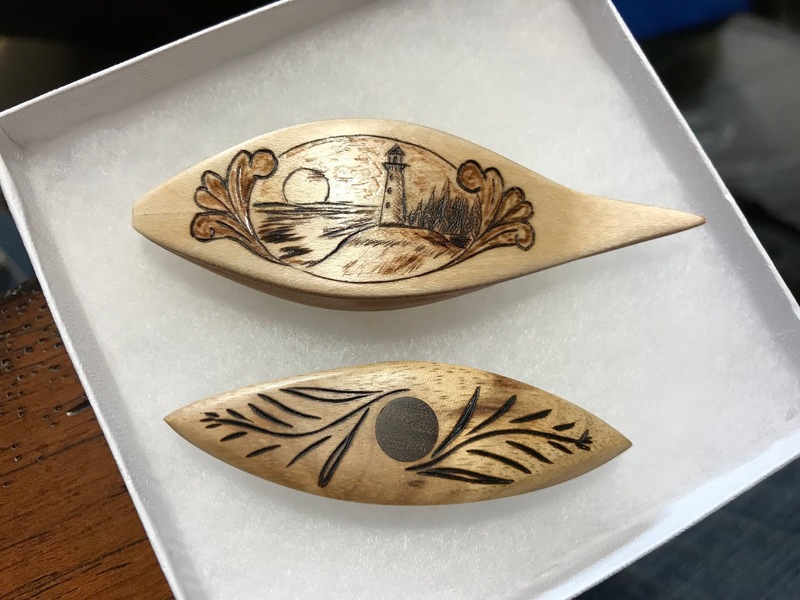 These two beauties are from Grizzly Mountain Arts. 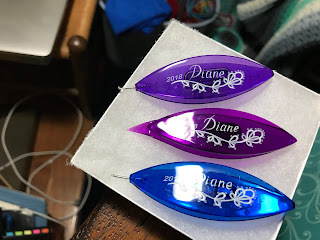 Rita Richmond of Shuttle by Design created beautiful shuttles to commemorate two years of the Ice Drop Addicts page on Facebook. 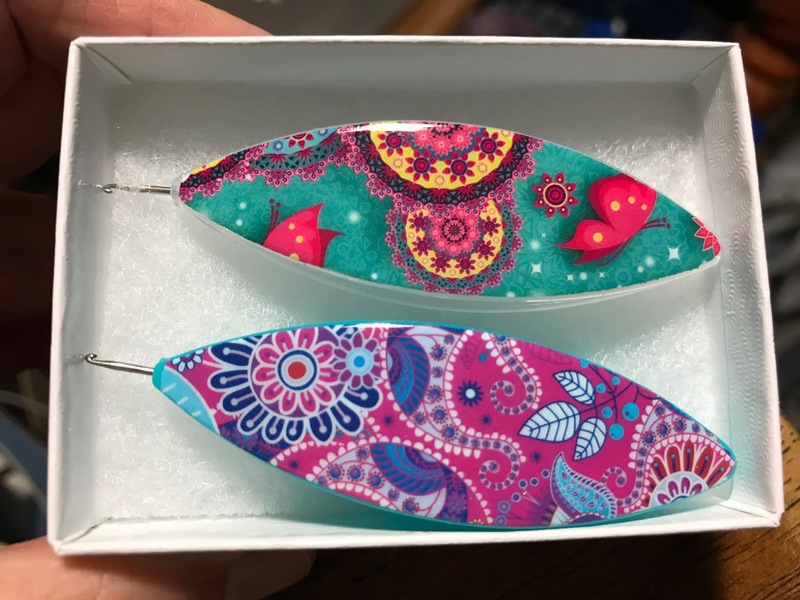 These two are Rita's style of shuttles. 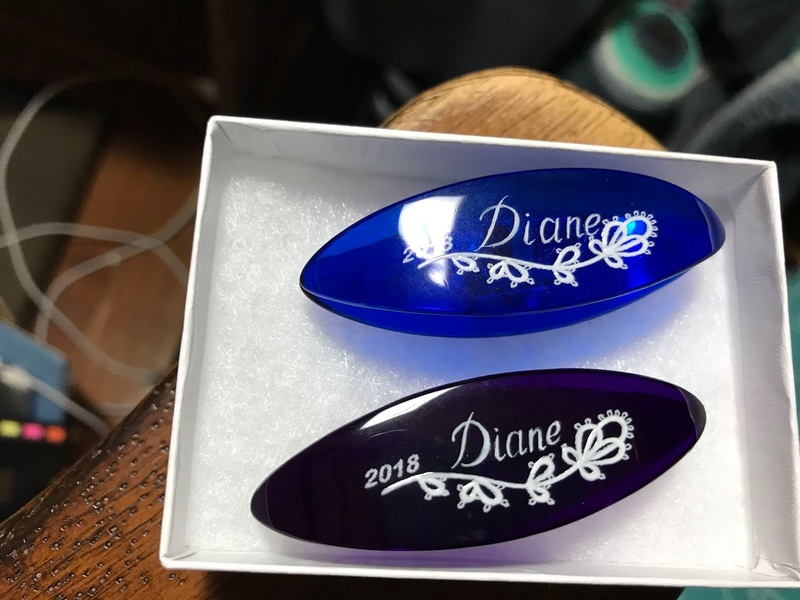 I chose to have the back decorated with my name and the date. Rita also offered decorated Moonlit and SewMate shuttles. 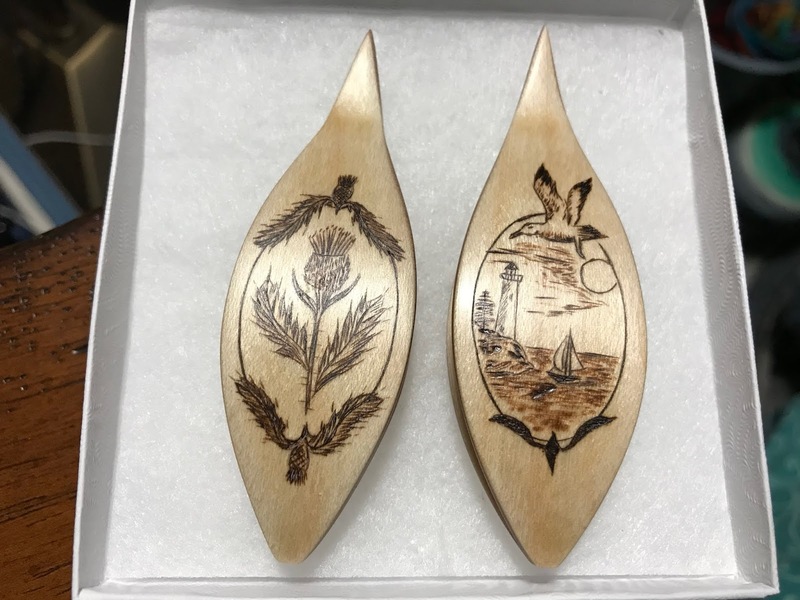 Of course, I had to have one of each. 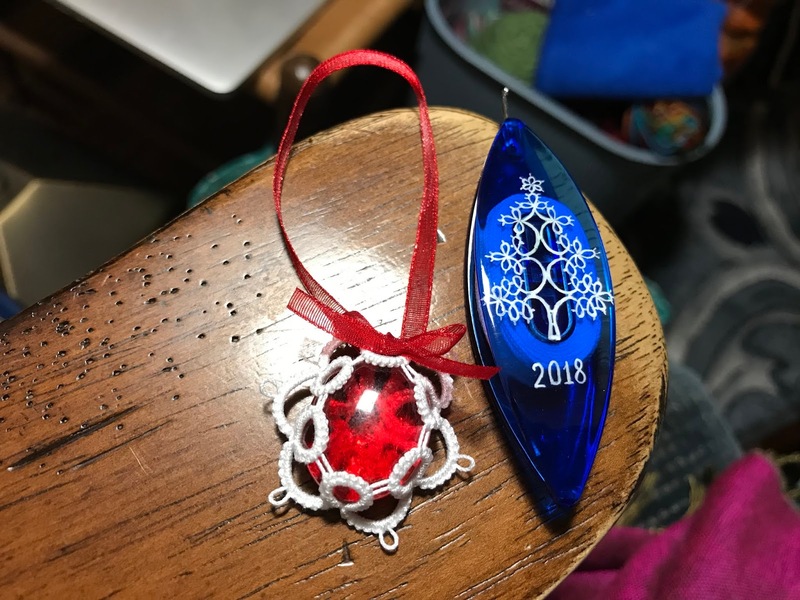 I love that Rita incorporated the Ice Drop idea into the design! 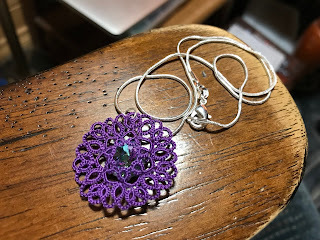 I finally finished the first of the necklaces promised to some of my high school girls. This one is for Ashley. 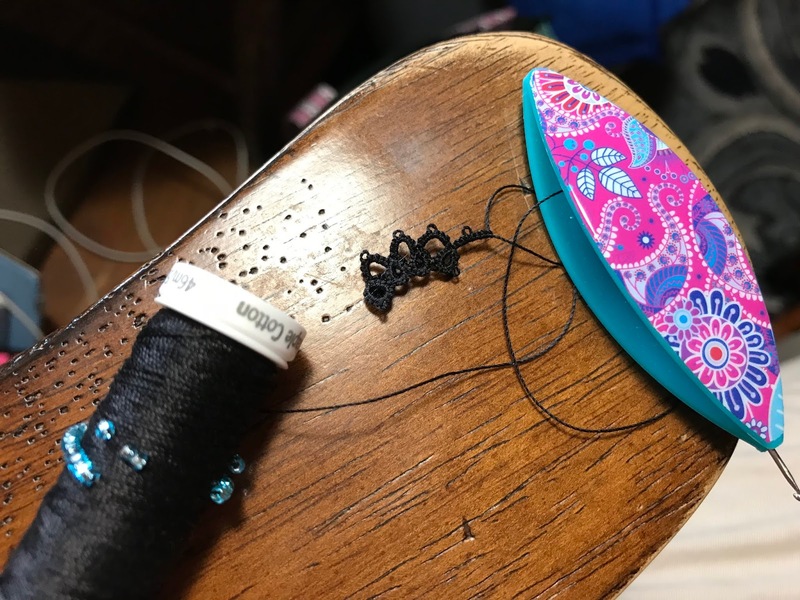 I chose to work on hers first, because I knew the black would be the most difficult thread to see. 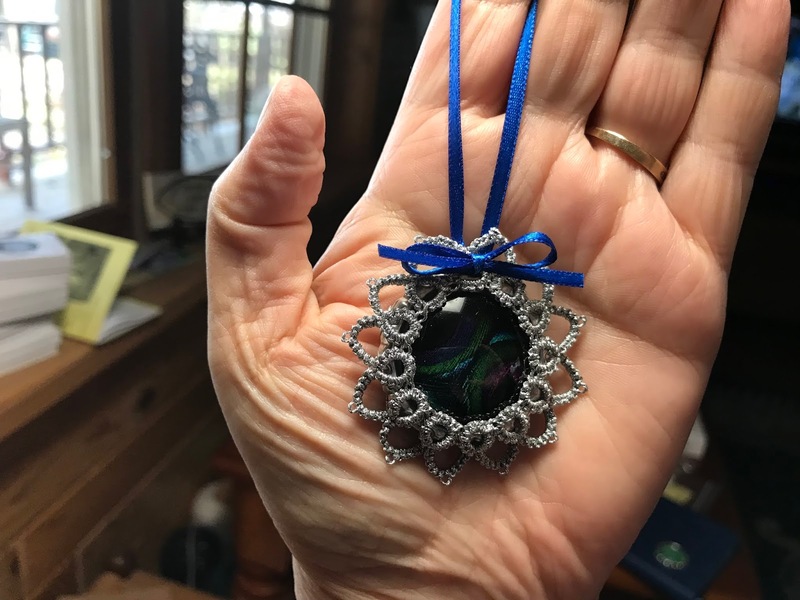 It doesn't show up well in the picture, but the blue rivoli and seed beads that Ashley chose show up beautifully against the black. 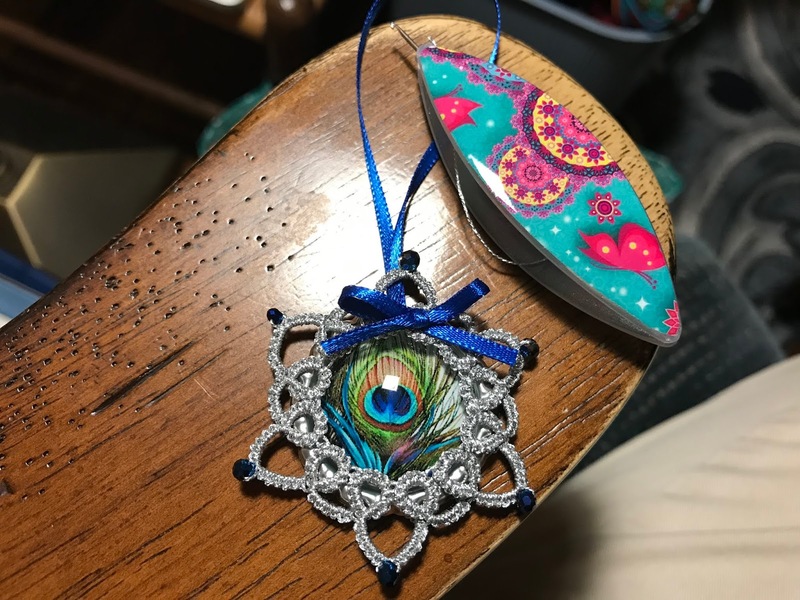 The center is a 12 mm Swarovski rivoli. The seed beads are from my stash. The thread is 12 wt Sulky, which is wonderful for tatting. 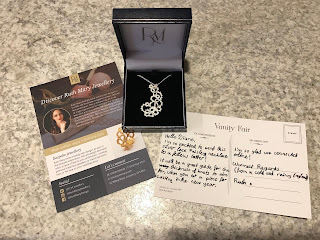 I found a deal on silver snake chains a while back. 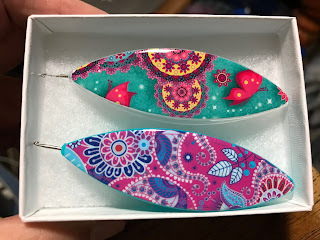 I wish I could remember where, because these are perfect for the girls' necklaces! My beautiful new paisley pendant from ruthmary.com arrived today! 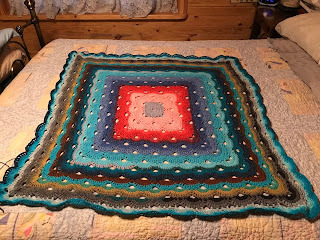 I am thrilled with it! Guess what I'm wearing to school tomorrow? 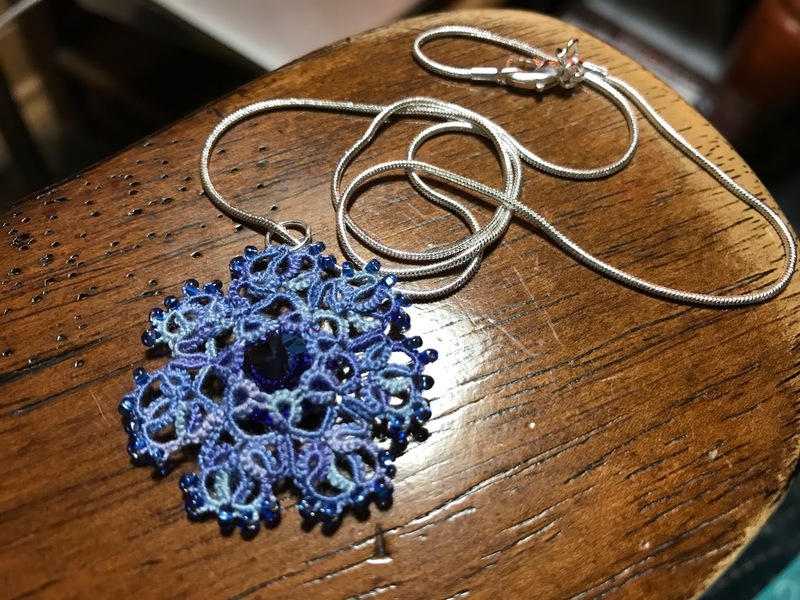 I am so please with the quality of this pendant, that I plan on sending a piece of my own tatting to be made into a pendant after the holidays. Ruth Mary also has a gorgeous Cascade Necklace. Do I dare have three? Daughter Joanne has been doing some Christmas prep and shared this picture of her Ice Drop display. 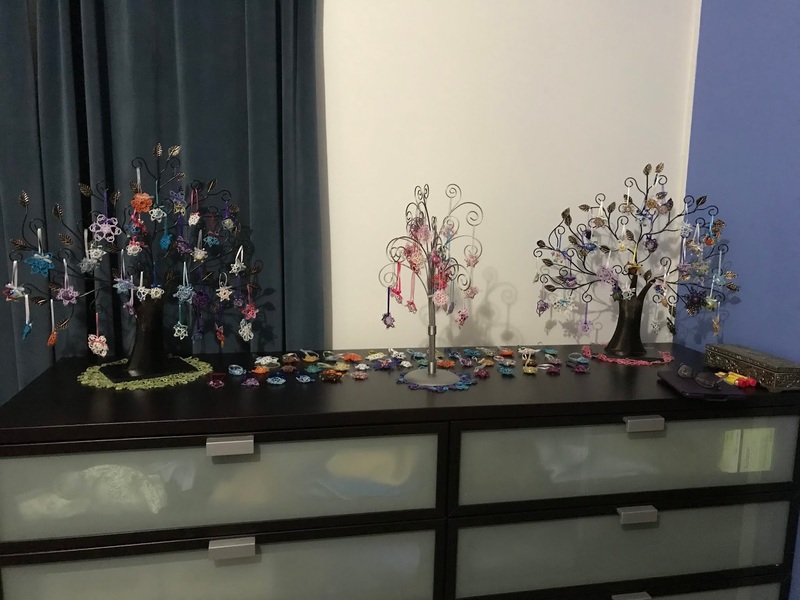 They don't all fit on the trees, so Joanne is going to make some wall displays. I'll share pictures once she gets them done. In the meantime, I think this display looks very festive! 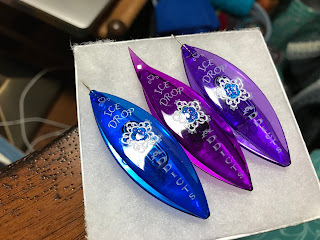 One of the new Ice Drop Addicts members asked what would be a good next step pattern for Ice Drops. 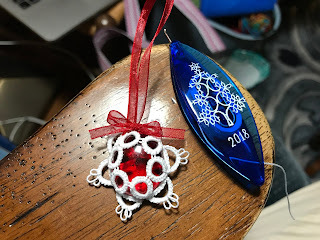 I decided to follow my friend Cindy's lead and work with red and white. 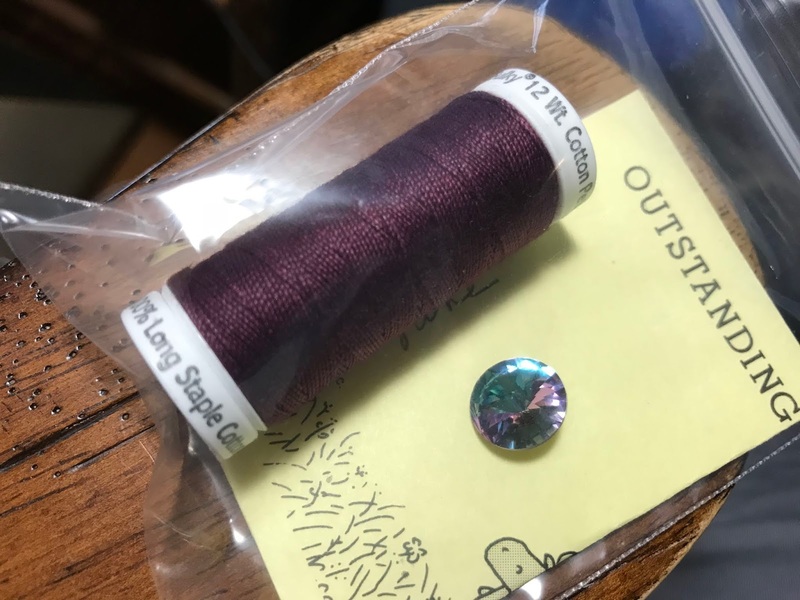 This is the basic pattern with a slight change in the stitch count to accommodate a slightly larger glass gem. Next, I added extra picots. After that, I used the one pass method. 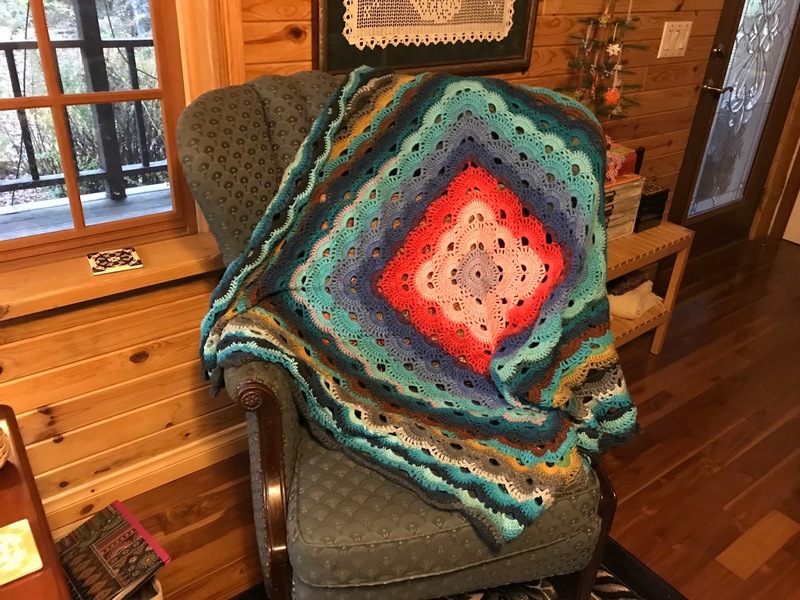 I think the basic pattern is great for quick gifts. I can finish one in about an hour, and I usually have an hour to spare each day... unless I get distracted! 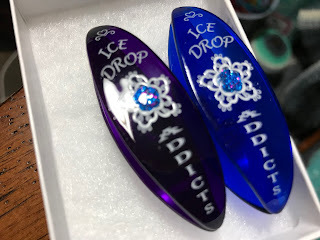 I'm trying to keep the bottle cap Ice Drops simples so that I can complete more of them, but they still take quite a bit of time. Christmas in the Village is just a few weeks away, and my Ice Drop supply is kind of low. 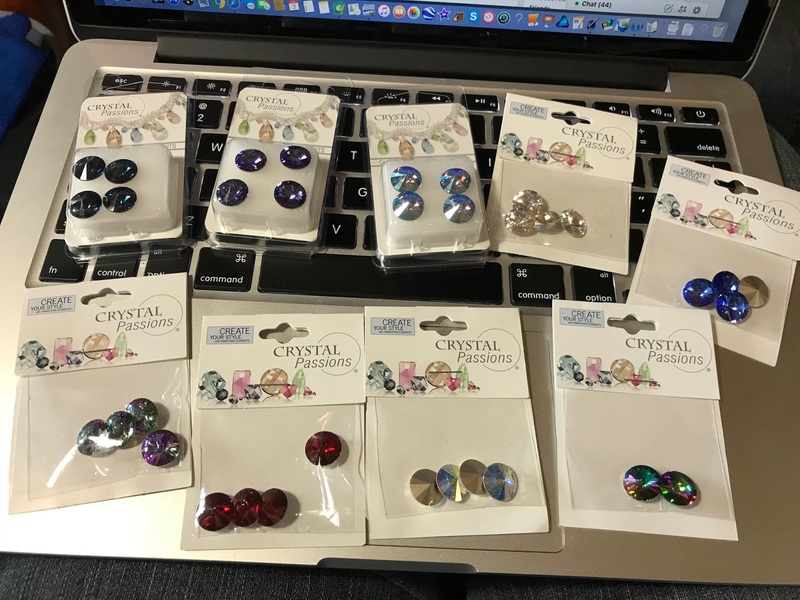 I think it's time to revert to basic Ice Drops so that I have a good supply on hand! Instead of trying to tweak the snowflake design I worked on last week, I decided to just work with the basic bottle cap design and alternate what I did with the chains. 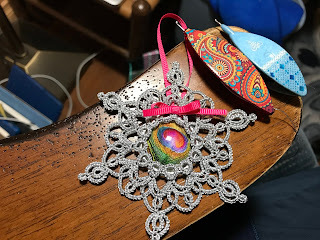 This is basically the first round of Shelley Perreault's Peacock Coins pattern. 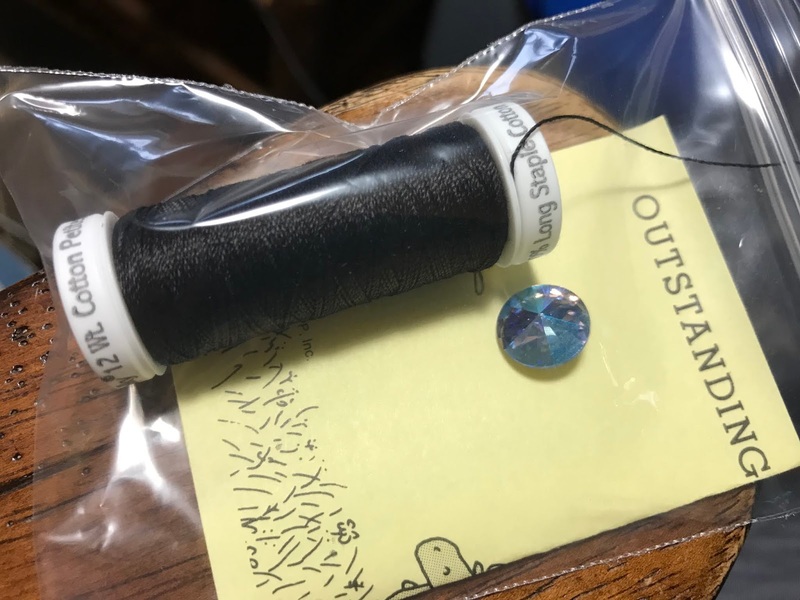 I've changed the stitch count to work with the flattened bottle caps. The rings are 5-4-5, and the chains are 5-5. 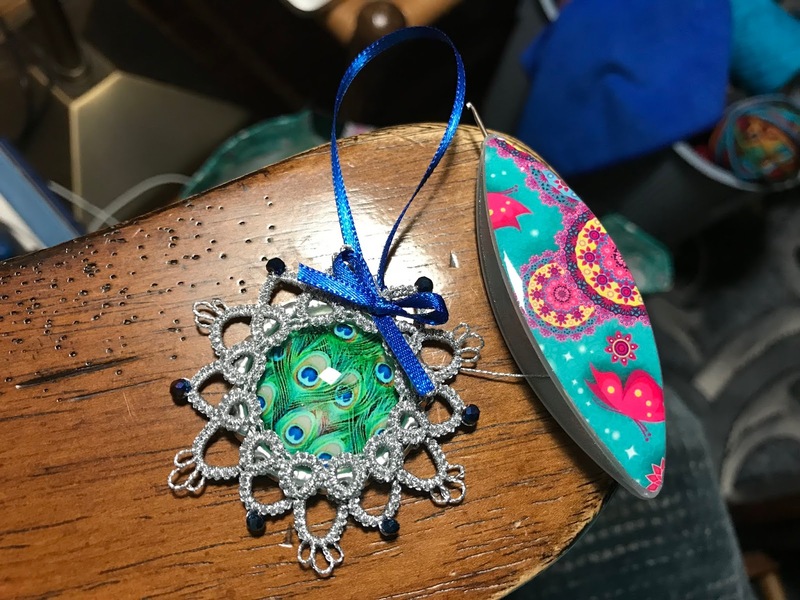 For this one I alternated placing a bead in place of a picot and having three graduated picots instead of one. I'm not sure if I like it or not, but I think I will try it again. 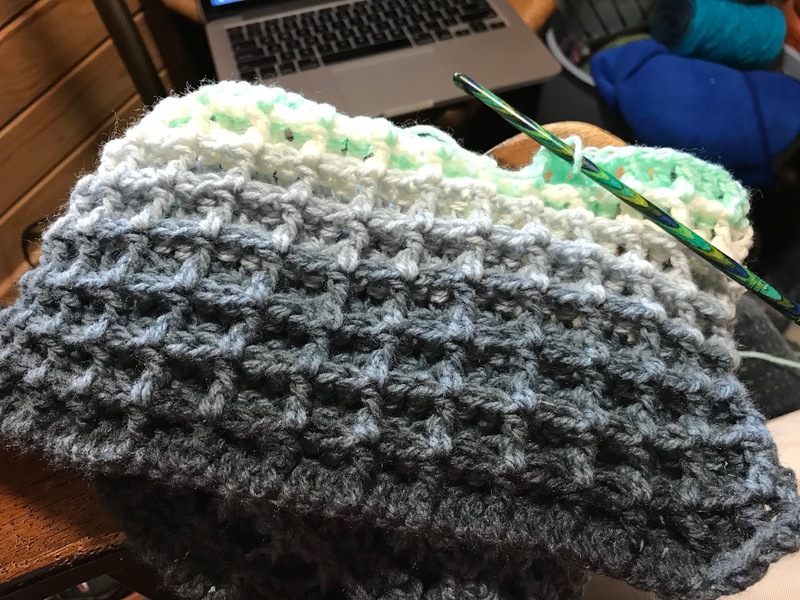 My waffle stitch afghan is coming along nicely. 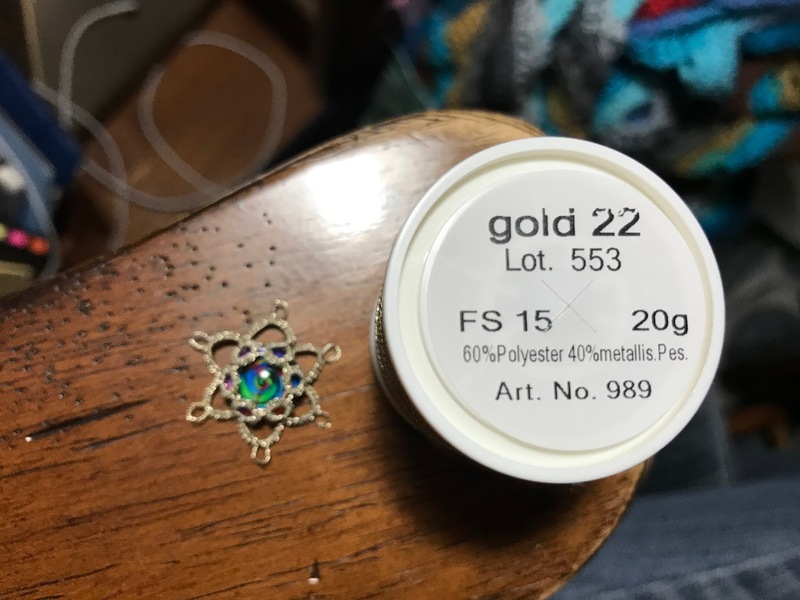 It's now 20" long, and I've just started on my third ball of Lion Brand Mandala, Genie. 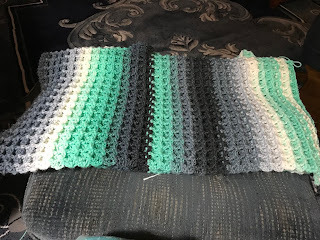 Will I reach my goal of finishing this by Thanksgiving? Only time will tell! I haven't had much time to work on crafting for the past few days, so I decided to keep this bottle cap Ice Drop simple. I felt the need to complete something! I don't know if you can see the peacock design in the cabochon, but it's really very pretty! Friday was Grandparents' Day at school, and I was subbing for the music teacher. I managed to crochet a little bit on my Waffle Stitch Blanket, but no significant progress was made. Yesterday was the dodgeball tournament fundraiser, organized by daughter Carol and one of the fourth grade teachers. In June, approximate 40 people (students, parents, and teachers) are taking a ten day trip to Europe! That's a pretty good sized group for our little town. To help the kids with the cost of the trip, some fundraisers have been planned. I was happy to help with this one. I didn't get to watch any of the dodgeball tournament, but I had great fun working in the concession stand. Any student going on the trip who chose to work at this fundraiser gets to share the proceeds. The kids were able to raise $1,600! I'm not sure how many of the kids were working, but I'm sure they appreciate the support received from the community! 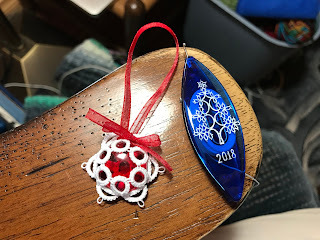 I finally finished my bottle cap snowflake. It's not quite right. I'm not sure if it's the thread I'm using (Liz Metallic Silver) or my tatting. I was experimenting with different ways of making the six points, and that's probably part of the problem. The idea is okay, but it definitely needs some tweaking! I finished the first ball of Mandala Genie. One ball worked up 9 1/2" of 36" wide fabric in Waffle Stitch. 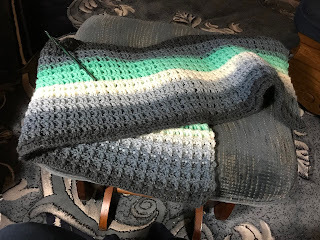 That means I have enough yarn to make this into a very nice lap size afghan! Sometimes I can dive right in with a project and all goes well. Other times... hmmm. I decided to start Ashley's necklace first. I wasn't so sure I'd like tatting with black thread, but so far, so good... with the thread, that is! 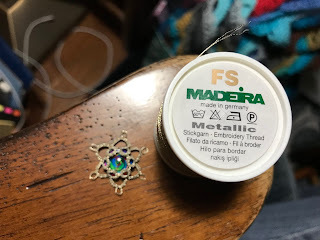 I eagerly started tatting and quickly realized the rings were going to be too big... snip! I tried another stitch count... still too big... snip! Then I forgot to string beads... snip! 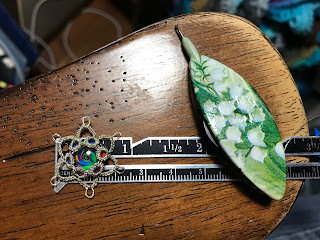 I forgot to add the jump ring, but I'm not snipping this time. I'll figure something out. 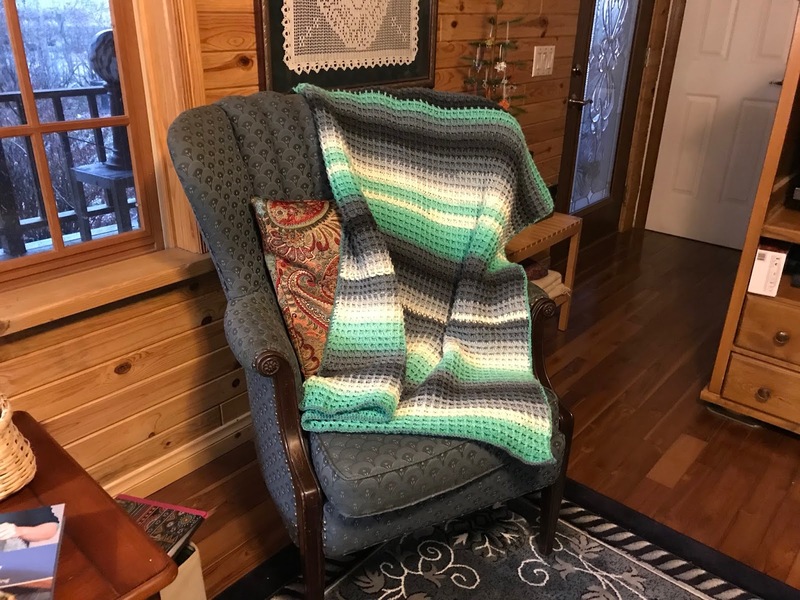 My friend Kalah sent a picture of a waffle stitch afghan she had made for her grandson, and I knew that was the pattern I wanted for Aidan's afghan. 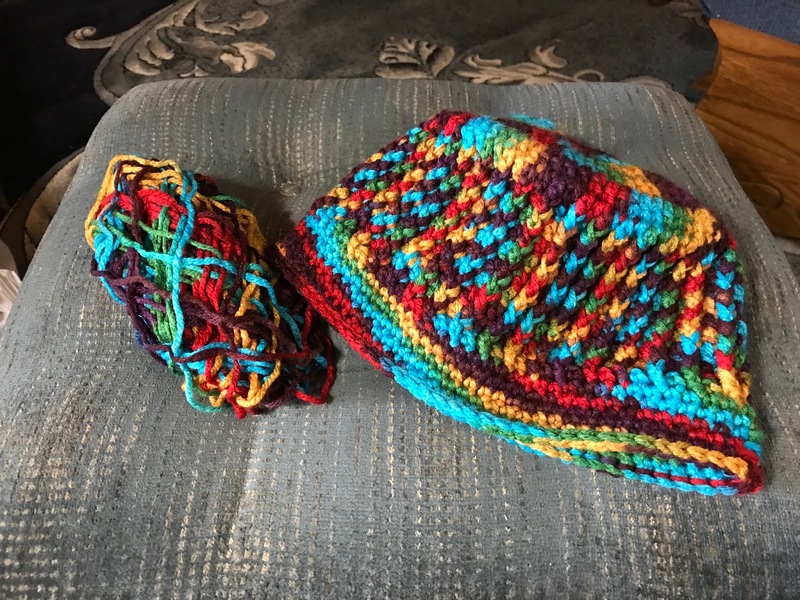 Aidan loves anything soft and squishy, and this pattern fits the bill! I didn't find an actual afghan pattern, just tutorials on how to do the waffle stitch... easy peasy, right? It took me several tries to get a stitch count and hook size I liked for the pattern. Now that I have it all sorted out, I'm on a roll! My goal is to finish this one by Thanksgiving, which will give me plenty of time to make Eva's. 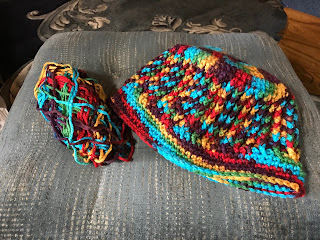 Time to crochet! ...or tat!